I am preaching at our church this coming Sunday on â€œHope Deferred.â€ Our texts are Psalm 25 and Hebrews 11:32-12:3. Itâ€™s been a fascinating week of study, thinking, and prayer as I work on this message. Here are three quotes that have been fresh in mind as I prepared for Sunday. â€“ John Calvin, letter to a pastor friend who had also lost his wife to death, 1557 (canâ€™t remember the date exactly). Yesterday I posted 5 things that I likedÂ and appreciated about Rob Bellâ€™s â€œLove Winsâ€ after reading it, reviewing it, and discussing it with many friends. But here I want to ask 6 strong questions that I would love to pose to other readers to thinkers out there. [please note: these questions DO presuppose that you read the book and know its flow]. What did Jesus do? In â€œDying To Liveâ€ (ch. 5), Love Wins sets the table for talking about Godâ€™s atoning work in Jesus but puts very little on the plate. Rob runs through an affirmation of classic atonement imagery and then talks about the cross and resurrection as a kind of cosmic principle and paradigm of dying-living. Thatâ€™s followed by our own dying-living – I take him to say thatâ€™s how we receive kingdom life in line with God. BUT â€“ I think that before we can get to emulation and following Jesus, we need real talk about what He has done for us. We at least need more talk of Christâ€™s identification with us/us with Him and, even better, our incorporation into Him through participation in his death and resurrection. The way Rob talks about it, the cross/resurrection loses some of its shine as a decisive personal action by a personal God in the face of sin, death, and evil. That leaves him hard pressed to say what exactly Jesusâ€™ death and resurrection deliver us from. Sin? Death? Evil? Ourselves? Maybe he didnâ€™t want to wade into the atonement wars or at least look for a new way to speak about it to the bookâ€™s audience, but Robâ€™s unclear here at the very moment he needed to shine a clear light. Why this kind of love? Rob comes down really hard on the kind of love that God is and does: â€œlove, by its very nature, is freedom. For there to be love, there has to be the option, both now and then, to not love â€¦ God has to respect our freedom to choose to the very end, even at the risk of the relationship itselfâ€ (104). So Rob puts us in the spot of completely autonomous individual agents with free will. Really? Thatâ€™s a pretty one-sided, modern, neutral view of freedom â€“ and frankly, I think Augustine or Aquinas or Calvin or Arminius have a much better handle on this discussion and just how the kind of love God is/has gets what God wants and we do or donâ€™t get what we want. And it simply doesnâ€™t take account of how broken and damaged we are by sin. What kind of God do we get here? In LW, we come close to getting a God who hopes you will be saved and a God who (we hope) might get what God wants. But if in the end â€œLoveâ€ really â€œWinsâ€ and in effect, conquers all â€“ if that love overwhelms the hardest heart and breaks down the strongest defense so that last of the guilty come in to the new city â€¦ how we have not just undercut the â€œfreedomâ€ Rob so eloquently defends in #3 above? Whereâ€™s the Spirit? Rob talks an awful lot about God and Jesus, but the Spirit is strikingly absent from the book. I especially noticed this in the beautiful â€œThere Are Rocks Everywhereâ€ (ch. 6). I think that has the effect of making God the distant and powerful one, and Jesus the loving and immanent expression. But then Rob tries to hang on to Jesus as the real dying/rising one who has reconciled and redeemed all creation AND call him the â€œsupracultural mysteryâ€ present everywhere, all the time, drawing people to himself. â€œJesus is both near and intimate and personal, and big and wide and transcendent.â€ True. I know what heâ€™s getting at, but I think his argument is bad theology that confuses the person and work of the Son and the Spirit. It is the Spirit who empowers witness and who draws all people (by whispers, dreams, signs, and yes â€“ preaching) and points them to the risen Son who is ascended with the Father. There is a lot of generous theology down the ages that articulates this way better. A careful read of Acts would do a ton to strengthen ch. 5-6 â€“ clarity on the cross and resurrection of Jesus, generosity in Godâ€™s witness to Jesus to all people in all places, even every creature under heaven. Why me, and why not God? Rob comes out here with a mashup of free-will theology and realized eschatology (the End has already Begun). I can roll with that â€“ I donâ€™t think itâ€™s the best expression of Christian faith (my Reformed roots leave me leery of the first part) but I can recognize it as in the family. But he stresses it so hard that in the end he is more confident that we get what we want than that God gets what God wants. Really? Oh Rob, do you really want to say that the better question, â€œthe one absolute we can depend onâ€ (116) ISNâ€™T whether God gets what God wants, but â€œdo we get what we want?â€ By God it is not! After a gorgeous chapter of building the case that Godâ€™s plans, intentions, purpose will stand and cannot be thwarted â€“ how can you go and throw our confidence not onto this marvelous God, but onto ourselves? Thatâ€™s to put it in the wrong place! Please God, let it not be about what I know or donâ€™t know that I want, but what God wants! To say that God honors my desires and I will get what I want â€“ some want heaven, some want hell – is way too thin an account of human wants. Remember sin, Rob – I am broken and bent, I do not always know what I want, I want good and bad, heaven and hell. â€œWhat a wretched man I am! Thanks be to God, who delivers me through Jesus Christ our Lord!â€ God rescues me from my wants â€“ not accedes to them. Itâ€™s not me and my love that wins â€“ itâ€™s God, and Godâ€™s love wins. 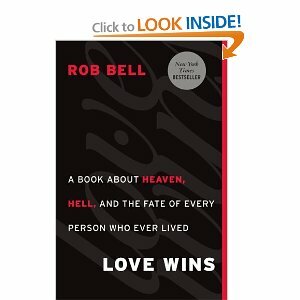 One of my personal joys this past spring was doing a group on Facebook to read through and discuss Rob Bellâ€™s Love Wins. When I did the sums/reviews of each chapter, I tried to be as fair as possible and understand what Rob was saying. After reading it, digesting it, and taking time to discuss it with others, I wanted to give a few short attempts at my comments. So to start with, here are five of my own likes or appreciations about the book. [please note: these comments donâ€™t presuppose you have read the book]. 2. Love Wins breathes Jesus and the gift of grace. Donâ€™t discount this â€“ the deepest stream here is relishing the Godâ€™s gift of human life in this world, lived here and now in light of the life to come. 3. Love Wins is better at heaven than it is at hell. The book is at its best when tackling â€œheavenâ€ (Here is the New There, ch. 2) and driving us back to a better early Christian view linking life now with the life to come. It continues that drive into the chapter on Dying to Live and There Are Rocks Everywhere. It is a less good when it addresses â€œhellâ€ (Hell, ch. 3) â€¦ but more on that below. 4. Remember – or at least, try to think about – the purpose and the audience. Iâ€™m guessing Love Wins probably wasnâ€™t written for someone like me. It comes from a pastorâ€™s heart and I think itâ€™s aimed at both those who have turned off or hurt by the evangelical church and those who wouldnâ€™t give it (or its Jesus) a first look based on its reputation. It addresses the very real questions that lurk in many hearts, questions some are afraid to ask because they have a tendency to deconstruct both methods and maxims (read ch.1 to get the feel for this â€“ it leaves you in pieces). 5. Love Wins is meant to start a conversation, not finish one. Or at least, I think so. Rob says up front that heâ€™s saying nothing new. I believe him on that one and recognize many voices behind his, and he points you to other sources if you want to dig deeper. Donâ€™t take it as a definitive statement, and donâ€™t expect him to show his work â€“ this kind of popular book wears a lot of its learning lightly. So take it as a challenge, go back to scripture, read widely, and donâ€™t be afraid to open the box and see whatâ€™s inside. Up tomorrow: some reservations and questions. You might have heard a bit about some controversy this past spring over a little book published by Rob Bell called Love Wins. 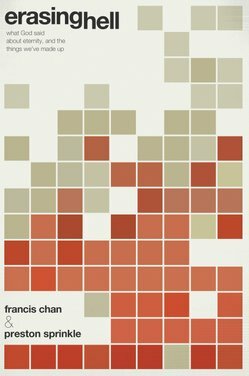 â€œErasing Hellâ€ is Francis Chanâ€™s foray into the subject of Godâ€™s love and the question of hell. Co-written with Preston Sprinkle (but in Chanâ€™s voice), â€œErasing Hellâ€ is both a counterpoint to some of Bellâ€™s arguments and a pretty good, short-form resource on the subject of hell and judgment (particularly in the New Testament). Let me do some summary before I get to appreciations and questions. Hereâ€™s my summary of Chanâ€™s argument. We live in a modern world where the traditional doctrine and image of â€œhellâ€ is falling on hard times and being reimagined, revised, or even rejected. We donâ€™t want to accept it or believe it, but we donâ€™t get that option. These arenâ€™t just issues of dusty doctrine â€“ they are destinies of real people. We donâ€™t get to decide these things: God does. A respect for Godâ€™s Word as our authority demands that we get back into the biblical world and understand the context, and when we do, we will discover that hell is real. First Century Judaism, Jesus, and the later New Testament are consistently aligned that hell is 1) a place of punishment (retributive) after judgment, 2) depicted with common imagery of fire, darkness, and weeping/lamenting, and 3) results in either annihilation or never-ending judgment (Chan thinks we canâ€™t conclusively answer that question). It is NOT a place of correction or purification or second chances. Implications? Anyone who declares or flirts with a kind of Christian universalism is misleading at best and downright dangerous at worst. â€œDestiniesâ€ are at stake, not just â€œdoctrines.â€ For the church, Chan turns the spotlight back on us and skewers the our willingness to believe in a literal hell but huge reluctance to truly live as devoted followers of Jesus Christ. Finally, he challenges people on their view of God â€“ do we consider ourselves above God, or will we submit to a high view of a God who can do whatever he pleases â€“ including allow a hell? So whatâ€™s to like here? 1) First, I appreciate Chanâ€™s humility and honesty in addressing a question heâ€™d rather avoid and looking to Scripture. He has a huge respect for Godâ€™s authority and his Word, so he pushes hard on us to be biblical as opposed to stick to a tradition or what is familiar or comfortable. (A personal note: Iâ€™ve sensed both of those things in him when Iâ€™ve seen him speak to students and on video). 2) Second, he is right on the gravity of the situation: whatever must be said on this matter should be taken seriously. Chan: â€œWhen it comes to hell, we canâ€™t afford to be wrong â€¦ too much is at stake.â€ That being said, it is awfully difficult to know if you are right here. If you donâ€™t tremble a bit when approaching this subject, that ought to give you pause. 4) Fourth, I appreciated his attention to context â€“ especially the 1st century Jewish world of the New Testament (thereâ€™s some great background here and in the footnotes). His examination of â€œhellâ€ in the Greek text and the wider language/imagery of punishment through the NT is much better than Bellâ€™s (who limited it to the words gehenna, tartarus, and Hades and thus missed some key passages). This is the really strong part of the book. Whatâ€™s not to like or what questions am I asking? 1) Why start out by tackling universalism? Ch. 1 starts with a survey of it that seems out of place â€¦ why not address the language and evidence first in Scripture and them come to conclusions? It sets the tone that this book is not really a study on hell that stands on its own two feet as much as a response and even polemic against some other writers. I was surprised how much of the book addresses â€œLove Winsâ€ in both the text and footnotes, and I found its critique of LW a bit sloppy at times. 2) Whatâ€™s behind the imagery regarding hell â€“ literal or metaphorical or â€¦? Despite a lot of language in â€œErasing Hellâ€ (including a Q&A on the issue), Chanâ€™s book doesnâ€™t convince me here. His alternatives are that the stock imagery in the NT texts is either literal or metaphorical. He lands on â€œmetaphoricalâ€ (rightly, I think) but then concludes there must be a literal hell (as a â€œplaceâ€) behind them. But what exactly are the images referring to? Is it (in each case) a literal place of hell (even if imagery is figurative) or can they serve as familiar markers for judgment and exclusion (much as we might say someone is â€œbeyond the paleâ€)? Since it is often (not always) directed at the â€œinsidersâ€ more than outsiders, does than change the context? Can the references simply be translated out of righteous/wicked into our familiar categories today of saved/unsaved or believers/unbelievers? Some of these interpretive questions go largely unaddressed. 4) What is God ultimately like? A key question for Chan is â€œwhat if God â€¦â€ or â€œcould you believe in a God who â€¦â€ In ch. 6, he tackles head on the language of Romans 9:20-23 and Isaiah 45 where God is potter, we are clay, and we donâ€™t get a vote. Chan wants us to face head on our low views of our Creator and â€œstop apologizing for God and start apologizing to Him for being embarrassed by the ways he has chosen to reveal Himself.â€ He is both right and wrong here. Heâ€™s right that itâ€™s not we who get our way and wants, but God who does so. Heâ€™s right to press the issue and ask the question when it comes to the attributes of God. But heâ€™s wrong to seemingly juxtapose Godâ€™s juxtaposing Godâ€™s love, mercy, grace with Godâ€™s holiness and justice and wrath. Heâ€™s right to say that yes, â€œGodâ€™s ways are incomprehensibleâ€ to us â€“ but wrong to not emphasize that they are nevertheless apprehendable in Jesus. Question: what is God really like deep down? Answer: look at Jesus and what you see there. There are fanastic books on this. He gives the beginnings of a good answer, but it needs a deeper treatment throughout. In my opinion from talking to all kinds of people and students, â€œhow can a loving God send people to hell?â€ is the deep down question lots of people are asking here â€“ not just whether hell is real. And this last is why I think Chanâ€™s â€œErasing Hellâ€ is good but not great. Bellâ€™s book had a lot of weaknesses, but it will be important (I think) in the long wrong because it fundamentally (and brilliantly) addresses what is God like, what does God want, and does God get what God wants? Chan asks the question as well, but tacks it on to the end rather than treating it as the golden thread throughout. Get it as a really good study guide for the issue of hell, but donâ€™t look to it as a place to dig deeply into Godâ€™s character in his work of redemption. update (07.08.11) – so it turns out that because I volunteered to review it, the publisher will let a few readers get free copies of Chan’s/Sprinkle’s “Erasing Hell” … so if you would like one, please send me your mailing address and the publisher will send it to you!